How would you like your assistant - Human or Robotic? (Nanowerk News) Roboticists are currently developing machines that have the potential to help patients with caregiving tasks, such as housework, feeding and walking. But before they reach the care recipients, assistive robots will first have to be accepted by healthcare providers such as nurses and nursing assistants. Based on a Georgia Institute of Technology study, it appears that they may be welcomed with open arms depending on the tasks at hand. More than half of healthcare providers interviewed said that if they were offered an assistant, they preferred it to be a robotic helper rather than a human. However, they don’t want robots to help with everything. They were very particular about what they wanted a robot to do, and not do. Instrumental activities of daily living (IDALs), such as helping with housework and reminding patients when to take medication, were acceptable. But activities daily living (ADL) tasks, especially those involving direct, physical interactions such as bathing, getting dressed and feeding people, were considered better for human assistants. The findings will be presented April 27- May 2 at the ACM SIGCHI Conference on Human Factors in Computing Systems in Paris, France. For instance, nurses preferred a robot assistant that could help them lift patients from a bed to a chair. They also indicated that robotic assistants could be helpful with some medical tasks such as checking vitals. 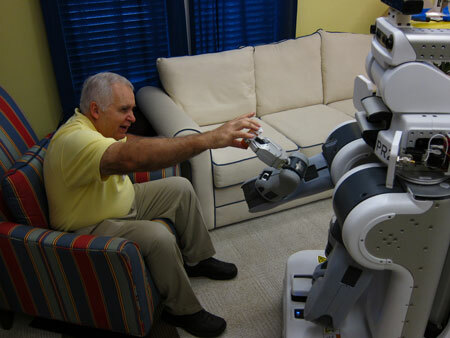 This study complements the lab’s prior research that found older people are generally willing to accept help from robots. Much like the current research, their preferences depended on the task. Participants said they preferred robotic help over human help for chores such as cleaning the kitchen and doing laundry. Getting dressed and suggesting medication were tasks viewed as better suited for human assistants.